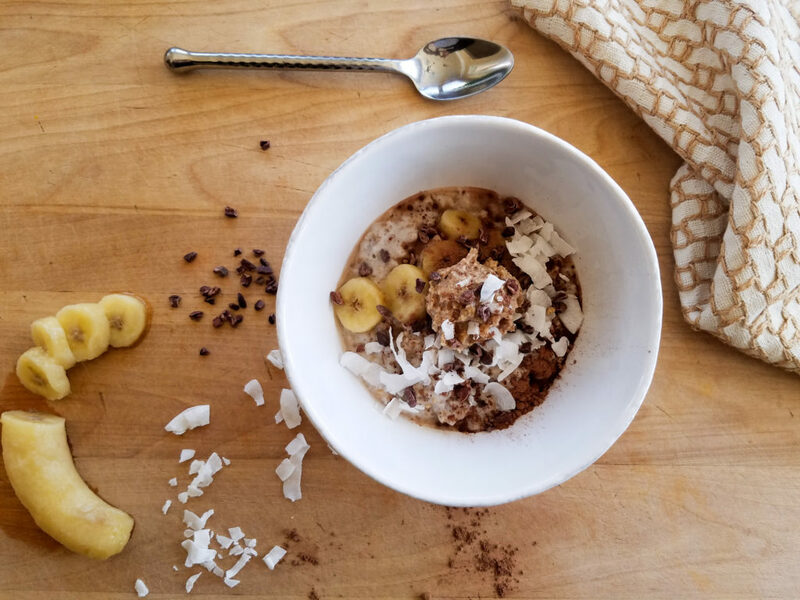 This delightful concoction of chocolatey overnight oats mixed with almond butter and bananas helped lift my spirits on a grey and cloudy day that started off badly. The other day I developed a bad mood early in the morning. I don’t really know why, I didn’t wake up that way, but almost as soon as I got out of bed things went downhill. I was already running late and had previously told someone I would be in to work early, so that obviously wasn’t going to happen. Plus, over the course of the past two nights I cut my hand three separate times while cooking dinner. They were small cuts but they hurt like the dickens and were throbbing this morning. They stung while I was in the shower and made holding my blow dryer nearly impossible. Later, as I was gathering my things together to leave I kept dropping stuff and I had to run back into the house twice for items that I’d forgotten; basically nothing seemed to be going right. I was feeling overwhelmed and more than a little sorry for myself. It even crossed my mind that I might actually be cursed. (It didn’t occur to me until later that morning that it was Fri the 13th, but I’m sure that didn’t have anything to do with it…)! 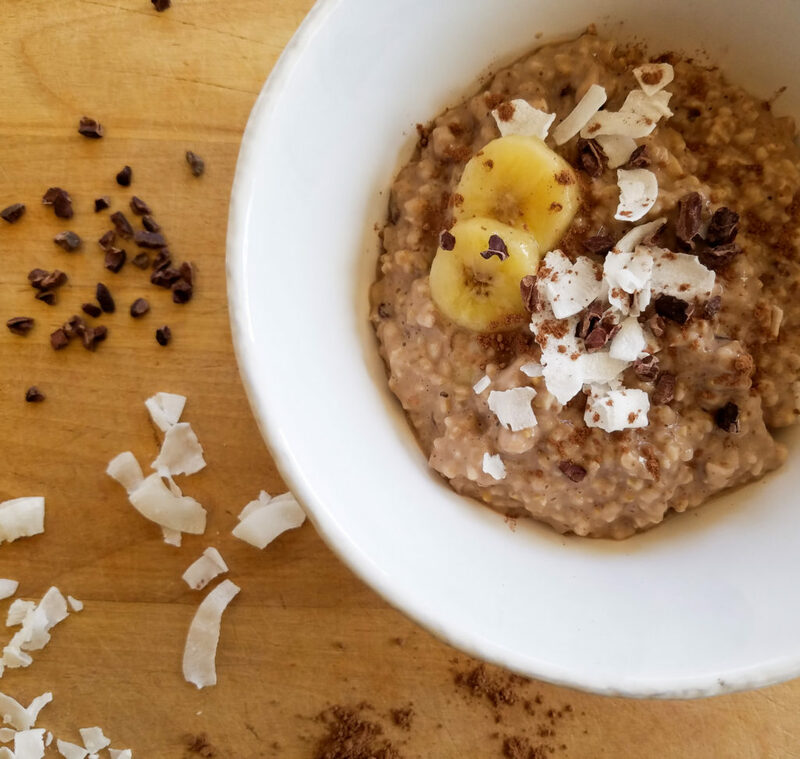 The previous night I had thrown some steel cut oats in almond milk for a quick, make-ahead breakfast but the next morning I found that I didn’t have any fruit or yogurt to add to the oats like I normally would. Looking hopefully in the pantry I found a bag of coconut flakes and some cocoa nibs. 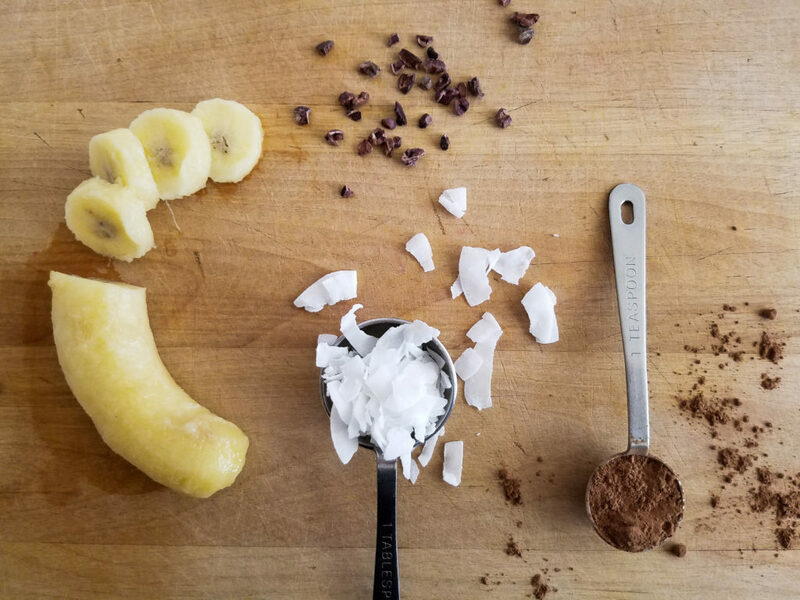 I grabbed those along with some cocoa powder and found a frozen banana I’d tossed in the freezer when it had started to get too brown. 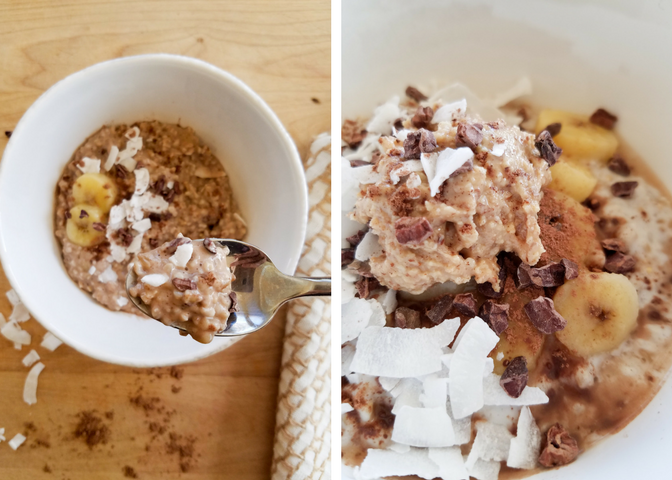 I grabbed the almond butter- thinking to add a dollop for protein and satiating fat. I dumped this all in a to-go container popped it in the microwave for 30 seconds to defrost the bananas a bit and ran out the door, dropping things and cursing under my breath as I went. At the first stop light I stirred it up and took a bite. Almost immediately I felt like my blood pressure dropped 10 points. 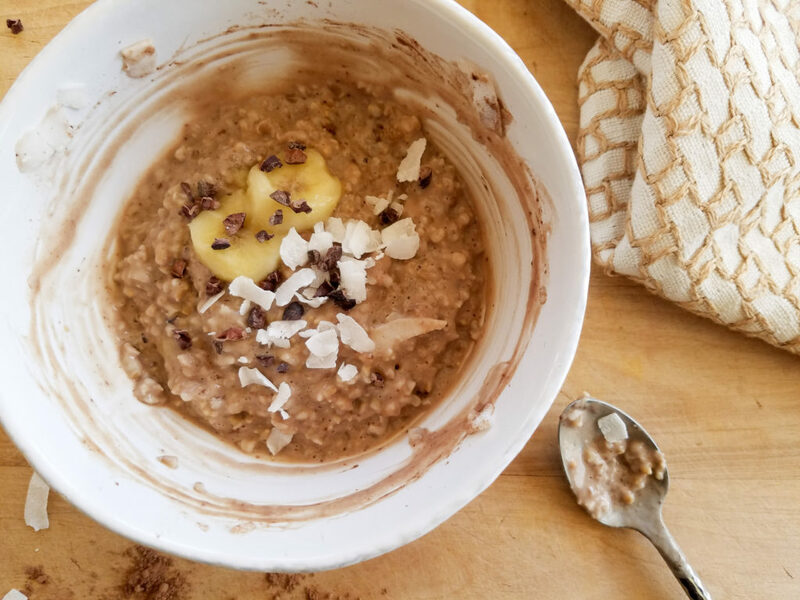 I don’t normally like a sweet breakfast but something about the creamy, chocolatey oats, the nuttiness of the almond butter and crunch of the cocoa nibs immediately lightened my mood. Chocolate is reported to have mood enhancing qualities because it contains phenylethylamine – a mood-regulating chemical found naturally in the brain, and some research has indicated it may also boost the brain’s production of serotonin, a natural antidepressant. I’m not saying this is something I would eat for breakfast every day, but boy did it seem to improve my mood on this day. So much so that when I finally got to work it didn’t even upset me when, forgetting that my keys, chapstick and cell phone were all in my lap, I stepped out of the car only to hear them all crash to the ground. Now that’s one magical breakfast! 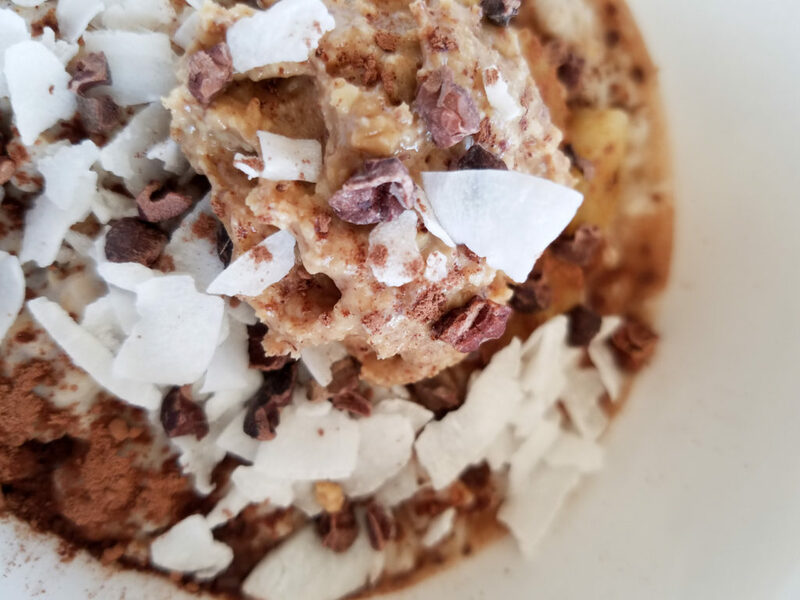 The sweetness from the banana and the almond butter were enough for my taste but if you prefer it a little sweeter a drizzle of maple syrup would do the trick. Makes enough for 2 servings. 1 cup unsweetened almond milk, or whatever type of milk you prefer. In a small sauce pan, bring the milk to a boil. 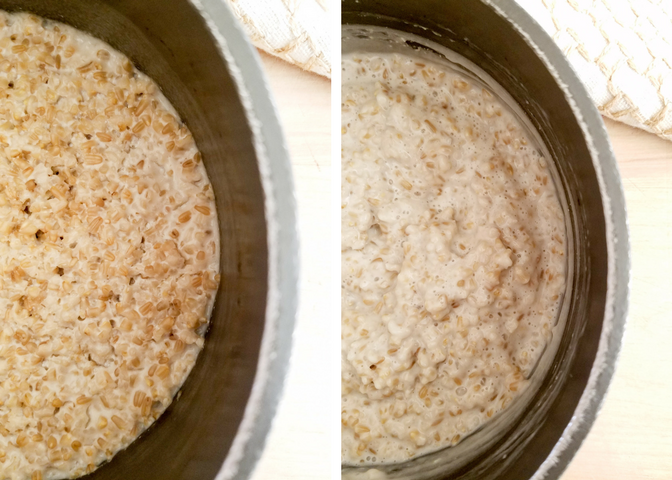 Immediately remove from the heat and stir in the oats and salt. Cover, let cool slightly and put in the fridge overnight. 1 teaspoon unsweetened cocoa nibs. Eat as is or microwave a few seconds to take the chill off. I made this last night for my kiddos and they loved it! I made a double batch and they ate it all for breakfast this morning!! 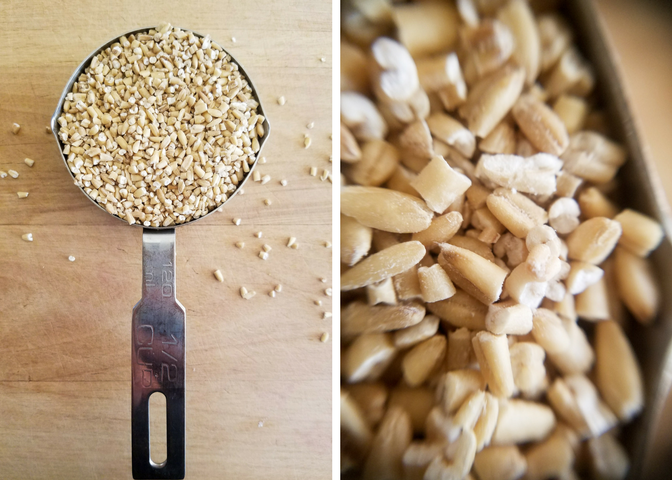 I am making it again tonight but tripling the recipe so I can have some too:) Love how simple it was, yet super tasty and healthful!